was higher among adults with less education, on average across the OECD zone. With all the economic turmoil of the past several years, have you ever wished you could buy an insurance policy to protect against the effects of a global recession? Well, such a insurance policy already exists – and it’s called higher education. During the first two years of the global economic crisis, in country after country, people with a tertiary (higher) education were much less likely to be unemployed, much more likely to be participating in the labour force, and more likely to have higher earnings, compared to their less-educated counterparts. These and other findings are discussed in the first issue of the OECD’s new education brief series, Education Indicators in Focus. As the crisis ramped up in 2008 and continued in 2009, unemployment rates increased across the board in OECD countries. However, the impact was much greater for adults without an upper secondary education. Among this group, unemployment rates rose from an already high 8.7% to 11.5%, and jumped five percentage points or more in Estonia, Ireland, Spain and the United States. 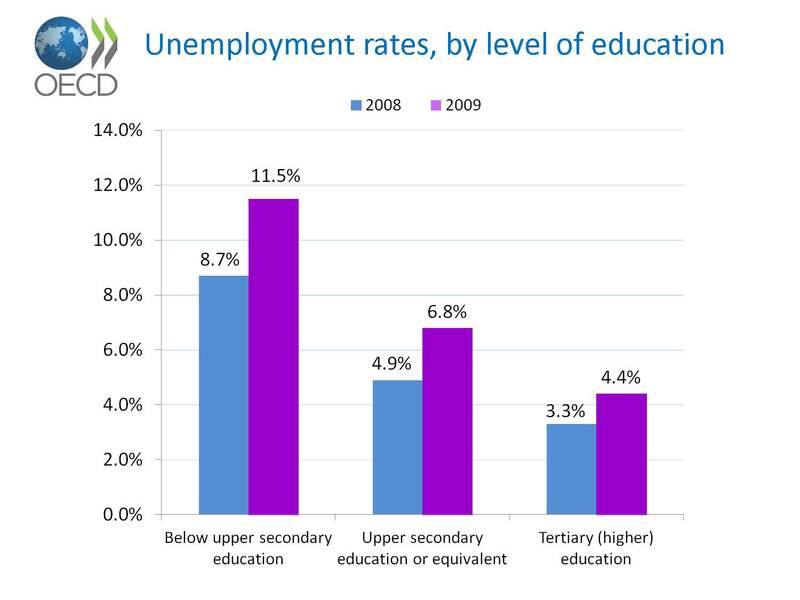 Adults with an upper secondary or equivalent level of education fared somewhat better: among this group, unemployment rates rose from 4.9% to 6.8% between 2008 and 2009 across the OECD zone. However, in Estonia, Ireland, Spain and Turkey, jobless rates reached 10% or more for this group of people – a mark generally regarded as troublingly high territory for unemployment. By contrast, people with a tertiary education were the best protected against unemployment during the thick of the global recession. Overall, unemployment rates in OECD countries ticked up just 1.1 percentage points for this group between 2008 and 2009, from 3.3% to 4.4%. Moreover, 2009 unemployment rates remained at 5% or less for tertiary-educated people in 24 out of 34 OECD countries, and surpassed 8% in only two – Spain and Turkey. Employment figures tell a similar story: during the crisis year of 2009, people with higher education not only had less trouble finding a job, but also had an easier time keeping the job they had. Across all OECD countries, 83.6% of adults with a tertiary education were employed in 2009, compared to 74.2% of adults with an upper secondary or equivalent education, and just 56.0% of adults without an upper secondary education. While a number of factors contribute to the level of adults’ participation in the labour force, higher employment rates for people with more education point to a better match between the skills these individuals possess and the skills the labour market demands, even during periods of economic crisis. What’s more, the sizeable earnings premium that university-educated people typically enjoy in the labour market held strong during the crisis years of 2008 and 2009. In 2008, among 14 OECD countries with comparable data, the typical employee with higher education earned 56% more than the typical employee with an upper secondary or equivalent education. Even in the face of the economic crisis, this premium increased slightly to 57% in 2009. By contrast, the typical employee without an upper secondary education earned 23% less than a corresponding worker with an upper secondary education in 2008 – and this earnings penalty remained the same in 2009. Having a higher education isn’t fail-safe protection from the consequences of a global economic downturn. But like any good insurance policy, it can help people recover when bad things happen to them. And with the economic outlook for 2012 looking as uncertain as it does, that’s no small comfort. Chart source: Education at a Glance 2011: OECD Indicators, Indicator A7.